The Endurance is being released under ORE’s ‘Frostline’ branding and combines improved ice mining systems with the well-proven mining frigate frame that served so well as the basis of the Venture and Prospect classes. Unique subsystems and fittings, coupled with a new compact ice mining laser design, give the Endurance the unique ability to harvest ice from a frigate class hull. In addition to this, the creators of the Endurance managed to retain much of the stealth technology that Expedition frigates have become known for. 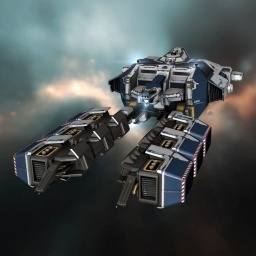 The Endurance is an ideal Expedition Frigate for mining in low/null sec space. Many people say that the Prospect is a better choice due to higher ore yield and the ability to warp cloaked, but the Endurance has a few advantages. It can carry drones and it travels at full speed (without prop mods) when cloaked. This means that there is no point in spending any ISK on a better cloak than a prototype cloak -- resulting in it being more economical to fit. The drones mean that you can survive null sec/low sec rats. In null, you can orbit an asteroid with an afterburner while your drones (must be tech II's and appropriate to the local rats) take out frigates, cruisers, and battlecruisers. You get good loot and the ships that can actually hurt you die. The Battleships can't hit you as long as you stay orbiting. In the Prospect you'd eventually need to warp off to keep from being popped. The speed while cloaked also allows you to more easily escape bubbles in null sec. Altogether a good frigate to grab those hard to come by ores that you are after. Further information about additional or recommended skills to pilot the Endurance for a specific or its common role(s) can be written here. In highsec icebelts you should orbit ice / orca / hauler / container with afterburner on with something > "catalyst blaster range" to make ganking harder. You can write additional notes for the Endurance here. This page was last modified on 26 February 2018, at 13:02. This page has been accessed 106,831 times.